London and Paris are two of the most popular European cities and so close it is very easy to visit both in one trip. They have history, architecture, and nightlife to offer tourists. And they have another thing in common. They are very accessible from several frequent flyer programs. One important thing to remember when you are planning a trip to these two (or any other pair of cities) is that you don’t have to fly two roundtrips. Even on airlines like Delta that do not allow one-way travel at 50%, you don’t have to backtrack. It won’t cost you any more miles than visiting a single destination. And it will cost less than two roundtrips. Avoid returning home from Heathrow though. The airport departure taxes from there are atrocious. I fly into London and out of Paris. Using American AAdvantage miles to fly to London and Paris will often cost you less miles than Delta and United, but only on off-peak rates (between October 15 and May 15). A three-leg itinerary New York -London, London – Paris, and Paris -New York will cost you 50,000 miles and a little over $200 in taxes. The amount of taxes will depend upon which airports you’re flying to and in what order. The booking process is very straightforward. You go to AA.com, choose Redeem Miles, then Refine Your Search, then AAdvantage Reward, and finally Multy-city. Fill out the information and choose the flights and the dates that work for you. Caution: one of the best features of any frequent flyer program is the ability to use partners. American Airlines has many partners: British Airlines, Finnair, Iberia, and Air Berlin, among others. You must, however, always avoid flying British Airlines across the Atlantic or the Pacific. Interestingly enough, American always pushes British Airways ahead of their own flights. Don’t take the bait. The problem is, British Airways imposes ungodly taxes under the guise of so-called fuel surcharges. Using British Airways for short flights in Europe, like London to Paris is fine, though. Using United miles to fly to London and Paris will cost you 60,000 miles year-round, and the process is also very straightforward. On United.com choose Multiple Destination, fill out the cities and the dates and don’t forget to check Award Travel at the bottom of the page. The resulting table will always give you the flexible options, even if you didn’t ask for them. Pick your dates for each separate flight, and you’re all set. What’s even better, feel free to choose any partner whose flights work for you. United does not add fuel surcharges to any of them. 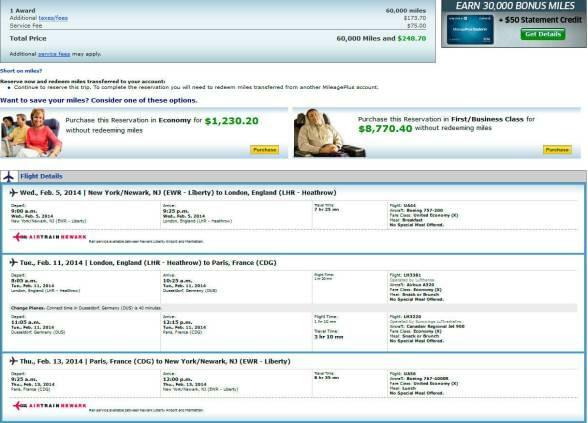 Your flight will cost you 60,000 miles and about $200 in taxes. However, there is no direct flight between London and Paris, so you will likely fly on Lufthansa via Germany. 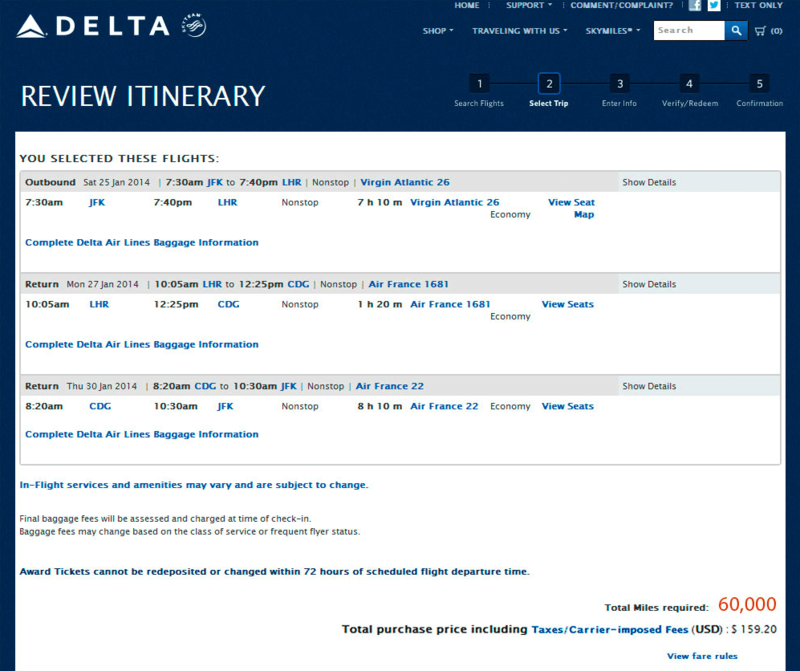 Finding flights at the lowest award redemption level using Delta Sky Miles might take a lot of work. However, this destination is not complicated and getting it for 60,000 miles is quite doable if you have patience, flexibility, and a little bit of luck. The Delta award calendar, however, needs to be searched flight by flight even though they have a multi-city search tool, and at the end you will still have to call in to finalize your reservation. There are positives of the Delta program. For one thing, they partner with Virgin Atlantic, and booking with Delta might be the only way to experience this cool, albeit over-hyped airline without huge fuel surcharges. Second, Delta is partners with Air France, which has direct flights from London to Paris. I recommend starting your search by looking for return flights between Paris and the U.S. (since the availability is harder to find) and work your way backward. 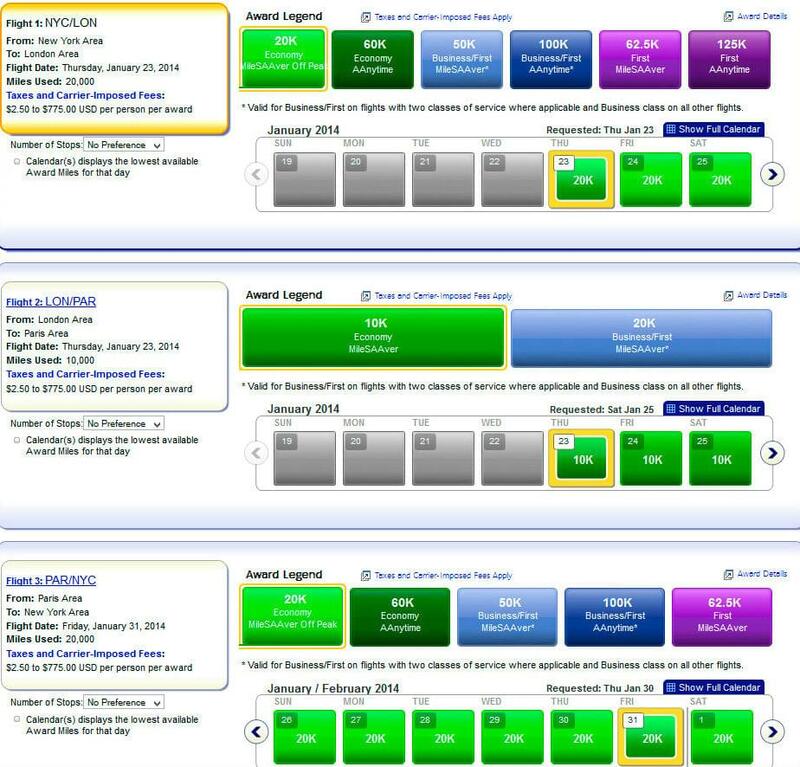 Look for the dates in green squares, and make sure you’re choosing the flights priced at 60,000 miles. When you line up all your flights, write down the flight numbers and the dates and call Delta to complete the reservation because more often than not, the Delta website will price your itinerary higher than it’s supposed to be.